The world is plagued by ego driven, self centred no-nothings who indulge in criminal behaviour to win the esteem of their peers. Now some of them have glorified their criminality in a film. After spending nearly 11 years in prison for breaking into an animal experimentation laboratory to expose animal cruelty, a young man is finally released and risks it all again to save more animals. Who is he? What kind of a person would risk so much to save the lives of animals? 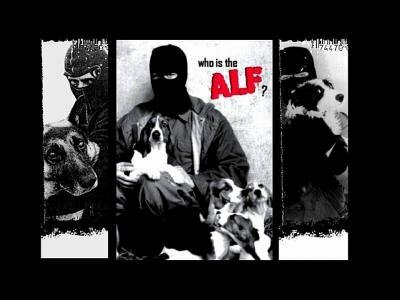 The Animal Liberation Front, comprised of clandestine animal rights activists, is now labeled the #1 domestic terrorist threat by the FBI. Who are these animal liberationists and why do they believe that breaking the law is the best way to help animals? What inspires them to challenge the status quo, fight against all odds, and endure public reproach? Director Shannon Keith goes BEHIND THE MASK and captures the hearts and souls of men and women who unveil their individual struggles for Animal Liberation. This controversial documentary weaves together the lives of people who face jail, devastation, and even death for their ideals. BEHIND THE MASK exposes never-before-seen footage that reveals the extent to which these individuals will go to save the lives of animals. People of all ages and backgrounds, from all over the globe, tell their tales of liberation, incarceration, sacrifice and determination, while exclusive underground footage reveals heart-thumping action sure to leave you wondering, who are these people? Does National Thinks This is Acceptable?